Leslie, the radio announcer, continues her on-air tirade against Superman, until her boss comes in and tells her that she's fired. He's not going to let her build a career on bashing Superman. Enraged, she draws some electricity off of a microphone (evidently her pre-existing meta power) and storms up to the roof. Climbing the antenna, she is struck by lightning and falls down to the ground as Livewire. Superman wakes up in an alley amid a group of homeless people. They tell him he fell right out of the sky, after his fight with the Queen of Fables. Thanking them for looking after him, Superman takes off looking for Lois, passing by Livewire on the way. Lois continues to be held against her will. She tries to talk her way out of it, but Willis has a gun and she doesn't fight him. He gives her some dead roses and asks her to dance. Superman hovers in the center of town, trying to find Lois, when Livewire steps out and attacks him. She broadcasts her message across Metropolis. Superman tells her he doesn't have time, but she doesn't let up her assault. Weakened from the Queen of Fables, he has trouble resisting. He figures he can either drain her power, or overload her, but there's no lightning to use for that. A crowd of onlookers attack her, and that gives Superman the opening to take her up into the sky. On the way, she tells him that Lois is with her crazy half brother. Superman swirls around in the sky, making lighting and shorting Livewire out. On the way down, she tells Superman where Lois is. Lois distracts Willis for a moment and punches him in the face. She tries to run, but he catches up to her and fires. Superman arrives just in time to catch the bullet right in front of Lois. Superman and Lois embrace, before taking Willis to the police. Two days later, Superman meets the Schumans for dinner. Josef shows Superman a picture of his son and talks about how he was never afraid, just like him. Superman tells him that he worries all the time, and that the world is full of extraordinary people who risk everything to help others. Those people inspire Superman to do what he does, not the other way around. Story - 2: And with that Simone's run is over, and I can't say I'm sad to see her go. This issue was like most of the rest of her run, mundane at best. I'm not really sure why she has trouble with this book, Villains United was great, but her Superman just isn't working for me. Now I can't say I approve of bringing Livewire in to the DCU proper, she was an animated character and probably should have remained there, but if she's going to be here, they could at least do it well. And by well, I mean giving her more than one issue. I don't see why we had to deal with the horrible Queen of Fables, when we could have had a nice three issue Livewire arc. I also have problems with her origin. If you're using a character from a different source, one would presume that it's because that character is a good and popular one. And if that's the case, then why would you change her origin. Making her into a metahuman that has been living with these powers forever removes any sense of motivation from the character. On the show, she blamed Superman for her transformation. A bit cliche perhaps, but it worked. Contrast that with this book, where she has ALWAYS had these powers (or at least since her teen years we can presume). Then she gets fired because her boss's wife happened to be involved in the fight with Dr Polaris (a little too convenient for me) and decides to scale the building and fight Superman. Um...ok. Maybe she would go after her former boss, but why choose this moment to attack the hero whom she has hated for a long time? More references to the Queen of Fables, this time when we find Superman passed out in an alley. Can't we just forget about her? And since when is Lois a wimp? I remember seeing her take down people much more threatening than a delusional photographer with a revolver. I'm not calling for the return of the GI Jane Lois that occasionally shows up, but she's a tough, strong woman who should have been able to deal with this situation. Compound that with the fact that this Willis is a horrible character. Why do we care about him? Why is he doing this anyway? Because he's crazy? That's way too simple an explanation. And his character isn't helped by the horrible lines he has. He gives Lois dead roses, and then remarks that he doesn't know why he did that...and admits that it's pretty weird. What? Maybe I'm missing something, but if this is intended to make him look unbalanced, then it isn't working. Oh, look at how wacky Willis is, he gives people dead flowers and acts confused. That explains why he kidnapped Lois. Right. Superman's fight with Livewire was actually decent, with the exception that he blames his performance on his weakness from fighting the Queen. If Livewire can only challenge Supes if he's already weak, then she's truly a pointless a villain. The ordinary citizens coming to his rescue I could have done without. I've come to refer to these as 'Spider-man moments', given that the first Spider-man movie had that horrible moment on the bridge. I understand the point of these scenes, to show the courage and bravery of the regular people...but come on. Superman can stop Livewire, but a sandwich to the face and a stomped foot slows her down? Lois just happens to be kidnapped by Livewire's half-brother. That's just ridiculous, and I don't think anything more needs to be said about that. There was one part of the issue that I did actually enjoy, the dinner with the Schumans at the end. I felt that, although the point of the conversation was a little tired, it really worked with the character of Josef. At first I didn't like the character, and really didn't see the point of him, but if this is where you were going with him Gail, I now definitely like him. And I think this really leads into my overall feeling on Gail's arc. Her Superman, generally, is written pretty well. He might not be exciting, but at least he's Superman. Some of the supporting cast works pretty well also. The aforementioned Josef Shuman and Jimmy to a certain extent worked well. The stories surrounding him, on the other hand, have been pretty bad. Repulse, the Queen of Fables, a poor use of Livewire, none of these have worked well. Hopefully the next run will throw something at Superman that's actually worth it. Overall, I can find some redeeming parts to this book, but not enough to even get it up to average. This is not a book I would ever give to someone to check out, and in a medium like comics that's a dangerous thing. I am curious to hear what people think about this issue and the run in general because there seems to be some disagreement about Simone's run on Action, and I'd love to hear what you all have to say. Drop me a line or post a comment here on the site and let me know. Art - 2: I was really torn between a two and a three for this. On one hand, Byrne's Superman has improved over the course of the run. He's gotten closer to the great Superman that can be seen back in Man of Steel and the first year or two of Superman. That Superman was a classic version of post-crisis Superman (probably second only to Dan Jurgens in my opinion) and it was nice to see that Superman reappear at least in spirit. You've improved John, especially since JLA two years ago, which was pretty horrible, so I respect you for that. However, and this is a big however, most everything else looks pretty bad. As I've said in previous issues, the art continues to look horribly dated. I'm not sure quite what it is about it, but this just doesn't look like a modern book. Combine that with the fact that Byrne cannot draw women at all (although even that has improved slightly throughout the run) and you end up with a comic that just isn't that pretty to look at. I give the book points for a good Superman, but everything else just drags it down. Cover Art - 4: The best part of the issue right here. 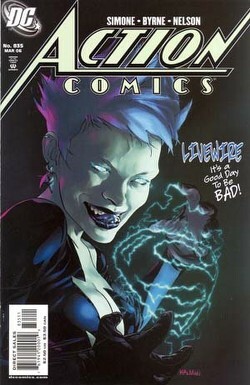 I like the look of Livewire, I absolutely love the coloring, and the lightning 'S' is really cool. I could have done without the 'It's good to be bad' line, but it didn't bug me too much. The only thing that really bothered me about this cover, honestly, is her tongue. Maybe that's a stupid reason to knock it down a point, but it really bothered me, so a four it is.